On October 23rd, I made a presentation at the opening of the first-ever meeting in the US of the Council for the Moroccan Community Abroad (CCME), which was formed as a result of provisions in the 2011 Constitution to engage overseas Moroccans in the civic life of the country. It is a unique experiment. I can think of no other Arab country that has set up a meaningful program to engage emigrants in such a broad way. Think about it…there are four provisions in the Constitution that call for extensive networking with Moroccan emigrants to ensure that they stay connected to what is going on and have input into policies that affect their interests. No where else is that even a possibility. Some, like Jordan and Egypt, have robust programs promoting inward investment from their overseas sons and daughters. But none, to my knowledge, is inviting these same people to promote policies that are important for them, whether it be in consular functions related to documentation and visas, efforts to attract talented and knowledgeable inputs for economic growth, or agreements with the host country on migration issues. Having worked in organizing the Arab American community for more than 40 years, I provided a historical context to the Arab immigrant experience, especially our participation in US political life. Talking later with conference participants, I was struck by two points: their relative lack of knowledge about the experiences of other immigrant groups, and their assumption that reaching out to Moroccans overseas was about how they could benefit from Moroccan government services rather than a broader concept of civic engagement. This may be due to several factors. First of all, Moroccan-Americans are among the most recent immigrants to the US from the Middle East and North Africa, starting in large numbers in the 70s. Most are first and second generation American citizens. So they have little experience in building networks with other Americans, whether in schools, cultural centers, or community affairs. What they do share with Arab-American communities is a high level of education, household income, and upward mobility. This “newness” and the lack of experience in the give and take of a robust political system is part of their inability to engage in public affairs whether in the US or Morocco. Secondly, Moroccan-Americans, like others, are strongly motivated by economic and professional opportunities in the US, so civic engagement takes a back burner to making a living, educating their children, obtaining advanced degrees, and similar efforts. Technology plays a big part in how they relate to Morocco. Today, like all émigré communities, Moroccan Americans have the internet and digital communications to keep in touch, at increasingly lower costs so that what is going on at home, particularly with one’s family, can be as close as the phone or computer. While there is distance, the feelings of separation are not as rigid as even 20 years ago. While the CCME process may have its imperfections, it is a tool that can be used by the community, if they mobilize, to give voice to their issues. The same energy that Moroccan-Americans show on the soccer field should be transferred to developing a collaborative community agenda with the government of Morocco. It is intriguing that Moroccans have a robust civil society at home and yet are unsure how to build similar networks in the US. Since many came during the reign of the late King Hassan II, advocacy was not yet on the public agenda. Today, King Mohammed VI is actively promoting the role of migrant Moroccans to help the country grow in prosperity, skills, and wisdom. So what is needed? Looking across the range of ethnic American organizations, we know that the most successful are those that are most focused, most articulate, best prepared, motivated, and patient. 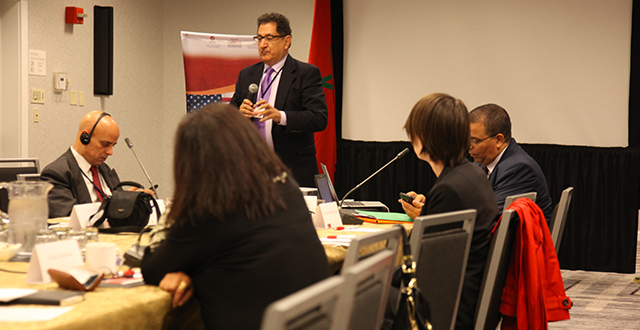 For Moroccan-Americans, a good place to start is by building better communications with their Embassy and consulates that go beyond political issues and consular functions. The community needs to have an agenda on which most émigrés can agree on as citizens concerned about their country of origin. Moroccan-Americans have strong social skills, which can serve them well in getting involved in their local communities. From education to transportation, health, and safety, there is no lack of interests that they have in common with their neighbors. Finally, it’s important to manage expectations – what can the government do, in what time frame, and how to benefit the greatest number? How can the community help set that agenda and ensure accountability? How can CCME get better in tune with the community in its follow up meetings in New York, Orlando, and Boston? How can you have a more inclusive process so that CCME has the benefit of a range of perspectives and attitudes among the community? Finally, what can you learn from the American experience of volunteerism, community and neighborhood councils, local government, and entrepreneurship, among other areas, that can be part of an agenda with Morocco. Keep in mind that this is a unique challenge, not a promise. For the first time in Morocco’s contemporary history, the King and the government want your opinions, insights, and recommendations. This is about more than affordable flights to the country. This is about taking an active part in shaping policies important to the émigré community who have much to contribute to the future of Morocco, a country I feel that you deeply love and cherish.